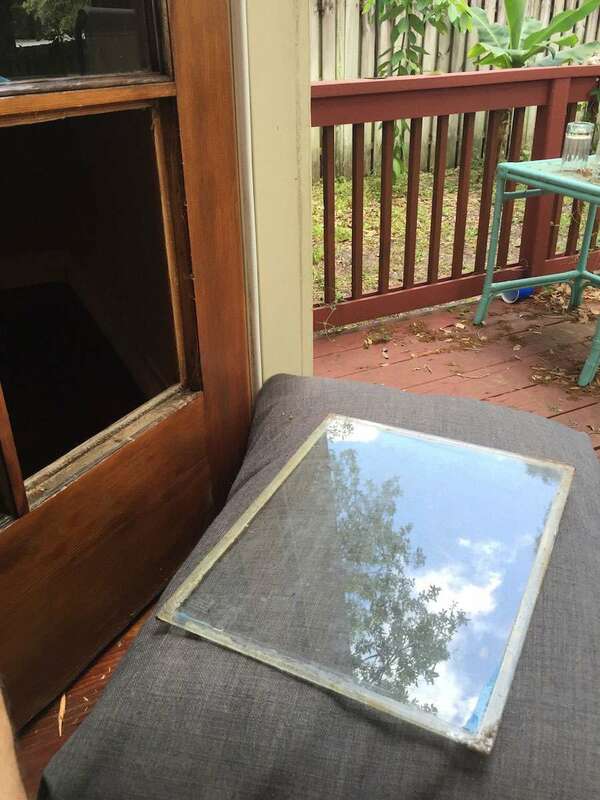 For around 80 bucks, you can make your own DIY dog door that can fit in any window pane or normal door. Note: This was literally Sydney's first time going through the door, so she looks a bit awkward; but after a few days of practice, she now glides through it like a champ. 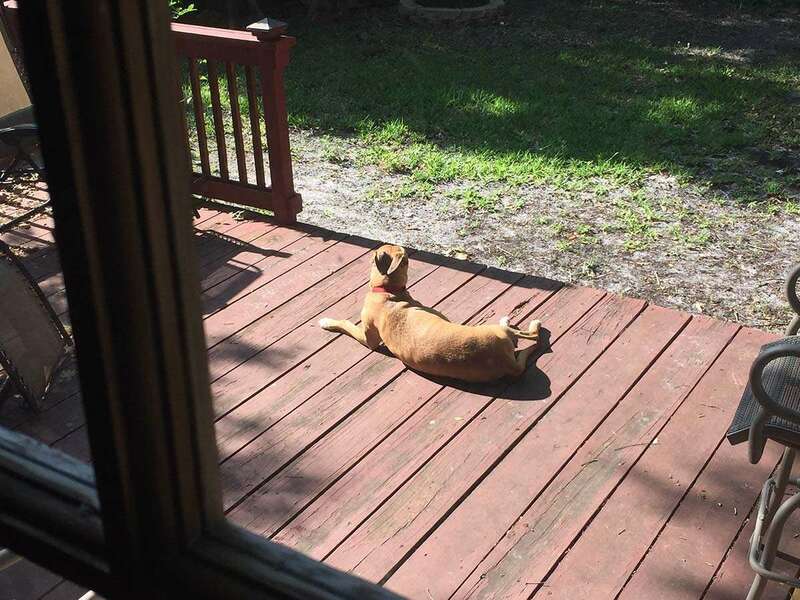 Sydney is a 55-pound Black Mouth Cur; when deciding whether this option is right for the size of your dog, I measure both the width and height of your dog's torso and ensure that they will be able to fit through easily and without straining. Remember, the final size of the opening will not include the window pane's molding, so the opening is larger than you might think (more on this later!). 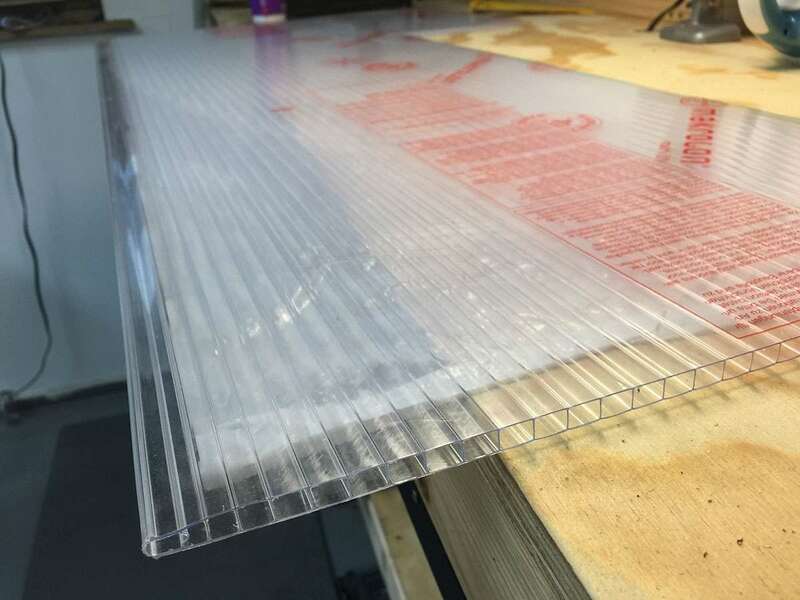 I decided to use a sheet of polycarbonate that's normally used for constructing greenhouses; it's lightweight, strong, inexpensive, and allows normal light through. Plus, you'll have plenty of leftovers for other projects! I included a link to the exact material I used at the top of this guide. 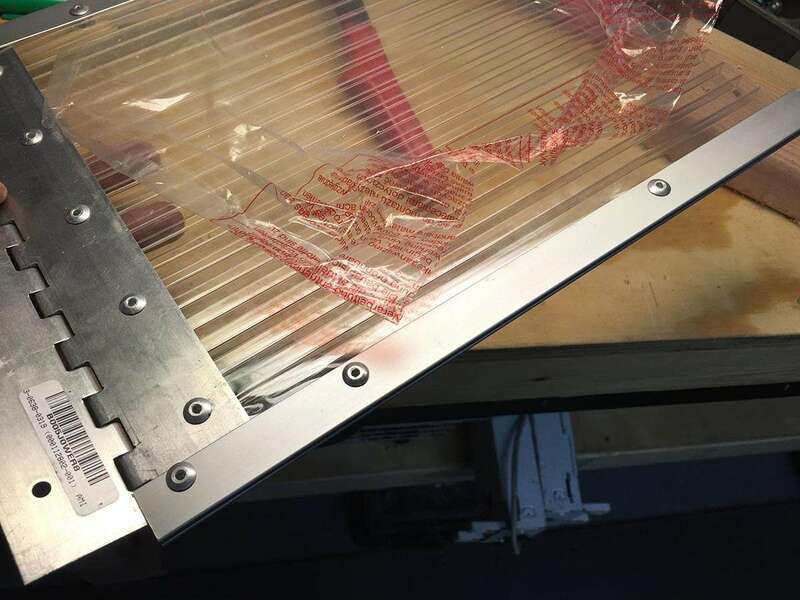 Keep the protective film on your polycarbonate until the project is complete in order to minimize scuffs and scratches. The hinge is an important part; I used an aluminum "continuous" hinge that I had left over from another project. It ended up being the perfect depth -- just as deep as my door is thick. If you don't want to use a continuous hinge, other hinges work great as well. 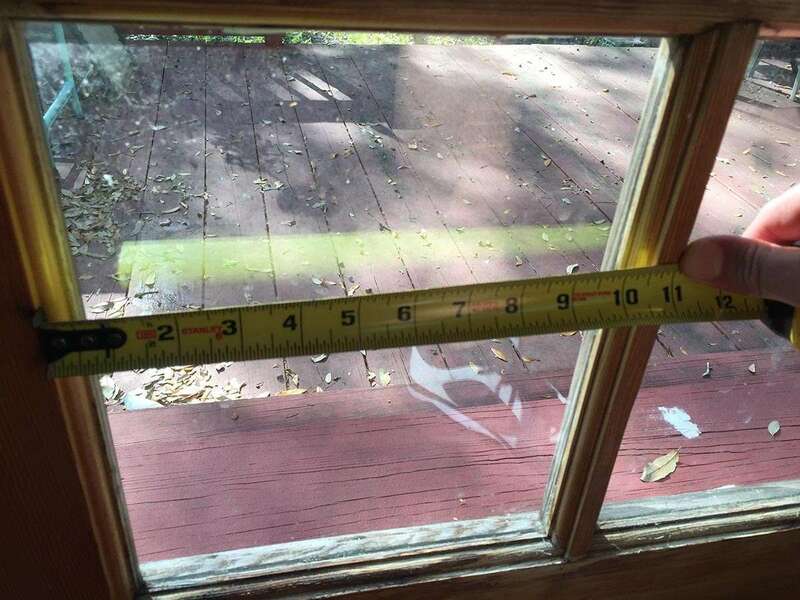 Measure the size of your window opening, excluding the window trim. 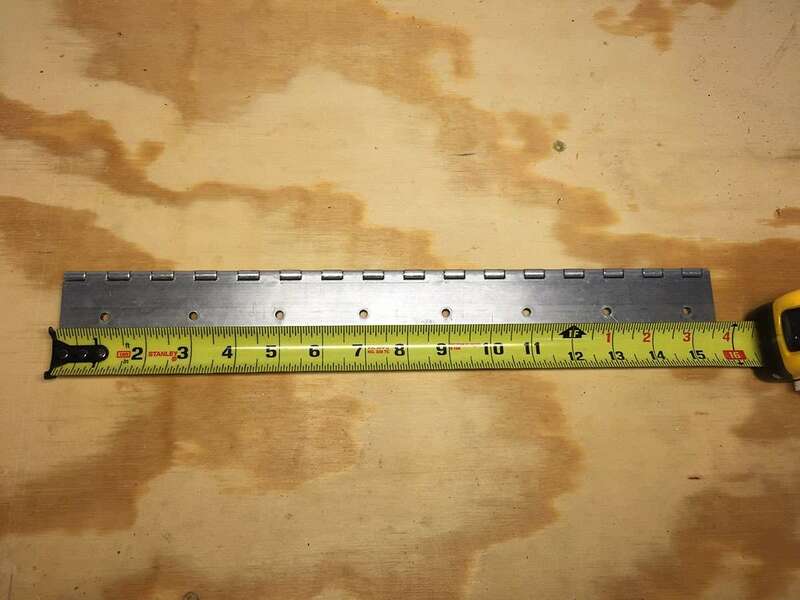 This trim will be removed when you install the door. You can use this dog door sizing guide to make sure your window opening (and dog door) will be large enough for your dog. My window opening is 10.5" x 13". 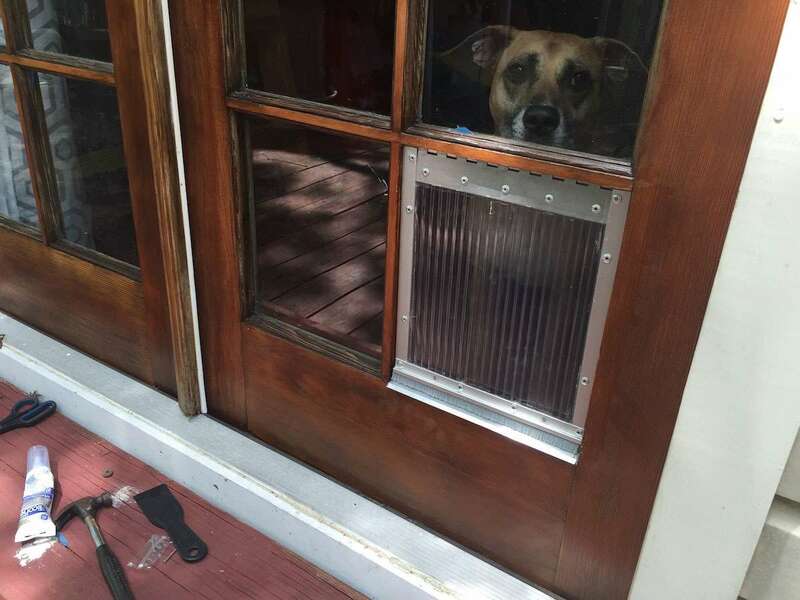 In this guide, I'll be building a dog door that fits into a window opening; however, you can also use this guide to build a dog door for installation into a normal solid-wood exterior door. 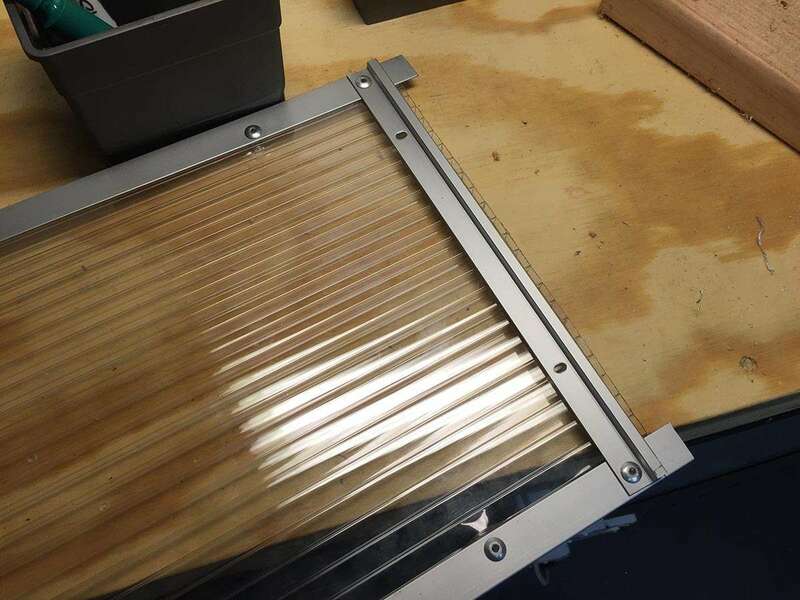 The panel needs to be slightly smaller than the window opening, since it will be surrounded by bristles that will form a nice seal (more on this later). 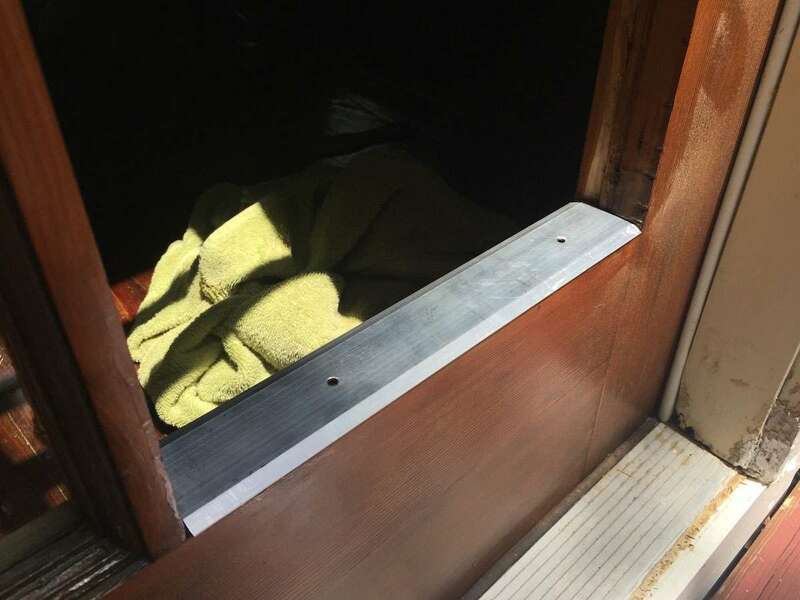 Also, the hinge needs to close (nearly) completely in order for the dog door to swing open in both directions -- in other words, you don't want the thickness of the dog door to prevent the hinge from fully opening and closing. Therefore, depending on the type and size of hinge you use, the final panel size can vary quite a bit. I started by cutting it to the actual size of the window opening and then testing fitment to see how much extra needed to be removed so that the hinge could open easily, and fully, in both directions. I ended up cutting my plastic panel to 1/2" shorter than the door opening height, and 1/2" narrower than the door opening width. I used a bandsaw to cut the panel to size; however, you can also use a box cutter and straight-edge to achieve the same result. 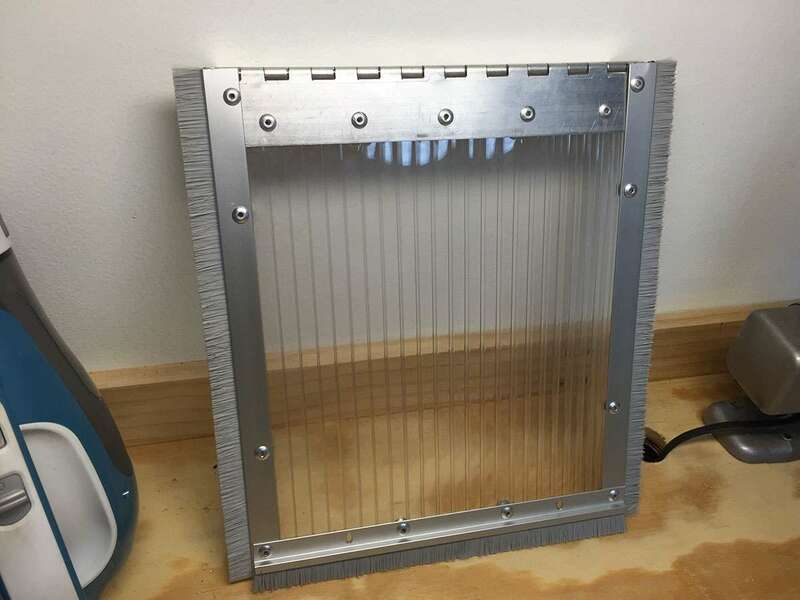 The panel is durable but cuts easily with a sharp blade. 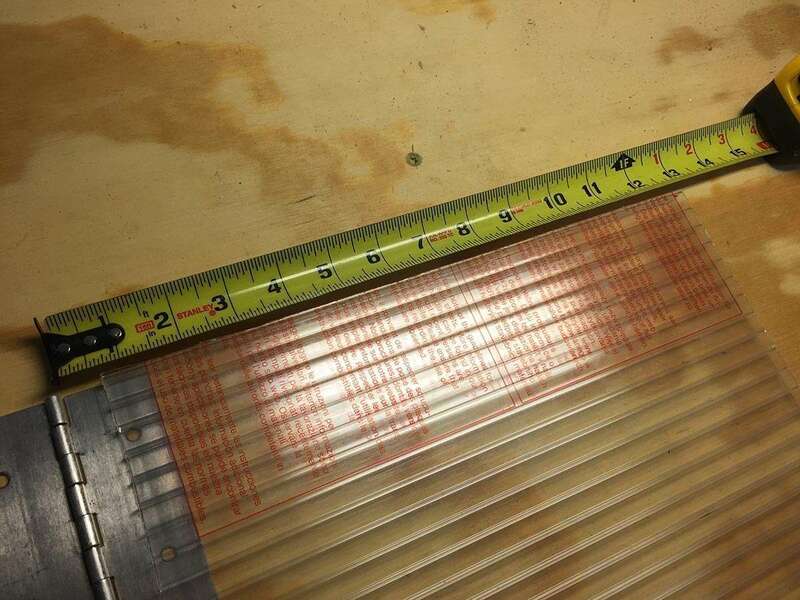 Be sure to cut your panel so that the "channels" run vertically to ensure proper strength. My final panel width is 10" x 12.5". Note in this photo that a gap is needed between the center of the hinge and the panel itself to allow the hinge to have full movement despite the thickness of the panel. The hinge should be as wide as your plastic panel. I used a bandsaw to cut the hinge. You can also use a hacksaw, miter saw with aluminum-cutting (disc) blade, Dremel, or whatever tool you have at your disposal. 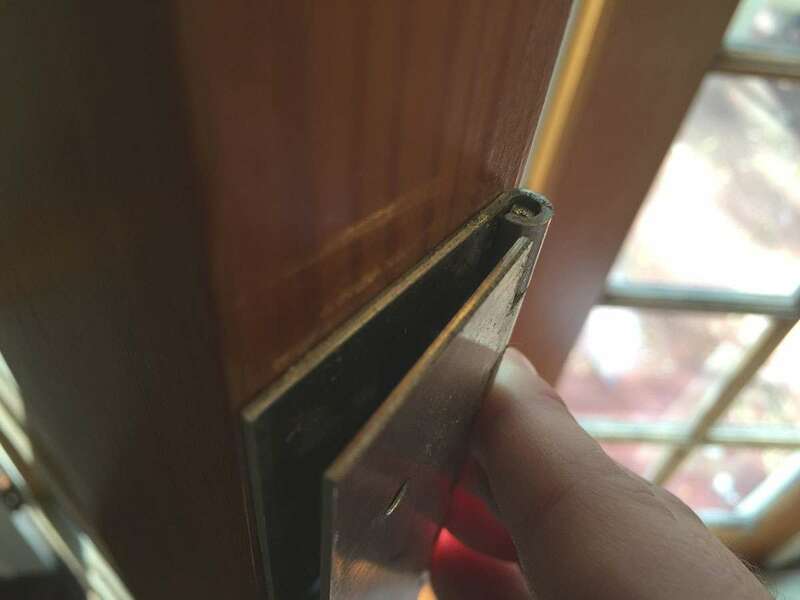 If you make a mistake and cut the hinge a bit too short, don't worry -- your door sweeps will take care of the gap. Door sweeps are normally used on the bottom of exterior doors to keep moisture and bugs out and keep conditioned air in. 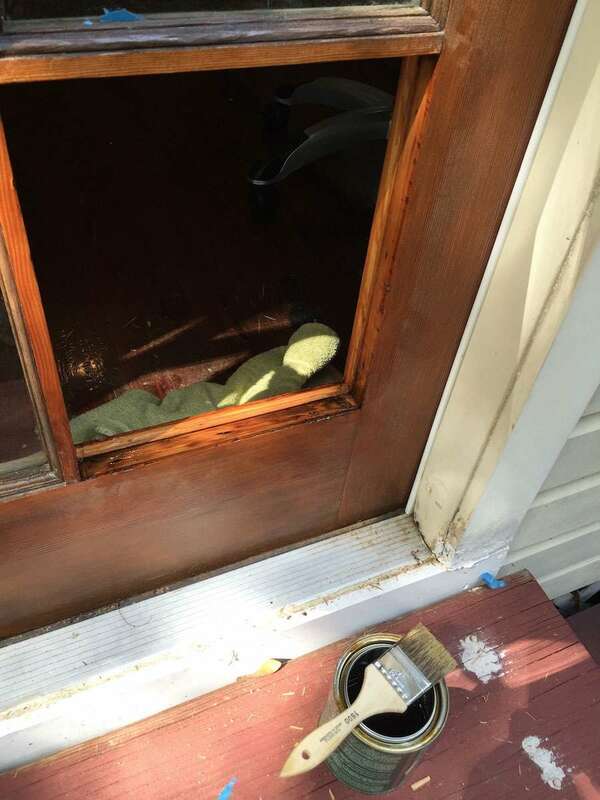 The door sweeps will create a seal around the dog door, keeping bugs and water from getting into your home. If you use a "continuous" door hinge, as I did, you'll only need to cut three sweeps -- two for the sides and one for the bottom. Cut the side sweeps to the height of the door opening (13" in my case), and cut the bottom sweep to the width of the door panel (10" in my case). To cut the sweeps, slide the bristle rid out of the sweep housing and cut the two separately. Then, use a bandsaw (or another favorite tool) to cut the rods and housings. 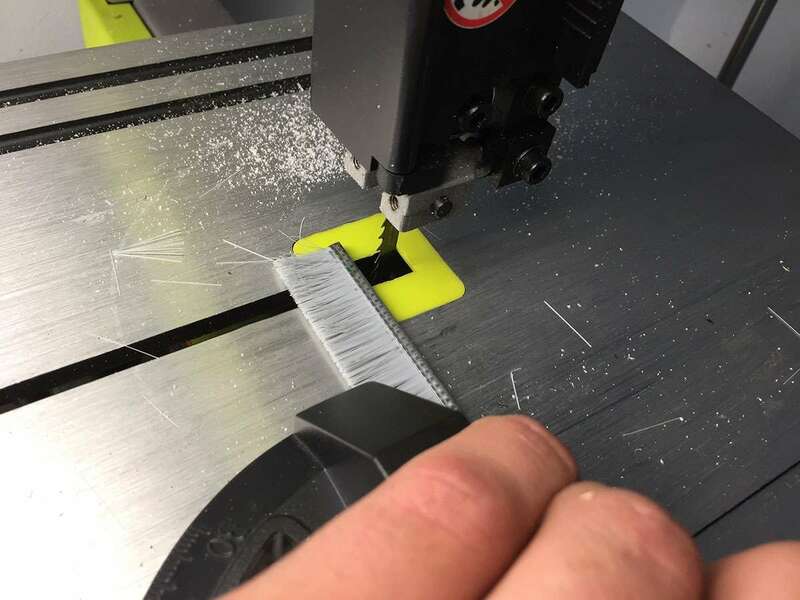 It is important to completely sand or file the edges of any cut component, or any component that may make contact with your dog; your dog will be using the door several times a day, so all edges of the hinge, sweeps, and plastic panel should be filed carefully so as not to cut your furry friend. Now that all your parts are cut, it's time for assembly! Mark and drill holes where the hinge will attach to the panel. Leave a bit of room (see photo) so that the door can swing open unabatedly. 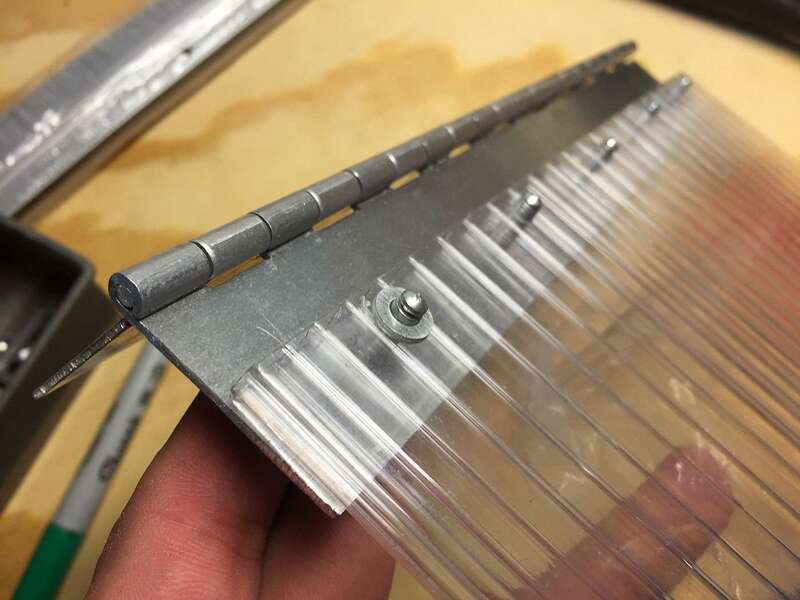 I used pop rivets and washers to attach the hinge and door sweeps to my plastic panel -- if you don't have a pop riveter, you can use bolts and washers. Here's a video showing you how pop riveters work. If you use bolts, make sure they aren't too too long as you don't want them to rub against your dog or get caught on your dog's collar. Mark and drill holes where the side door sweeps will attach. Using pop rivets (or bolts) and washers, attach the side door sweeps to the panel. You may notice my side sweeps are longer than my door panel. This is because I screwed up my initial measurements (I've corrected them in this guide, though). I ended up trimming things at the end, so everything worked out fine. Mark and drill holes where the bottom door sweep will attach. Using pop rivets (or bolts) and washers, attach the bottom door sweep to the panel. 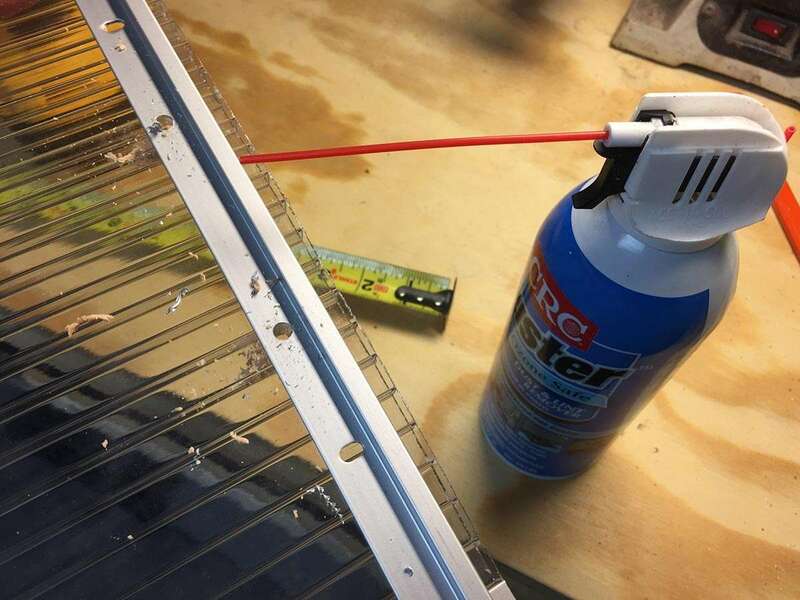 I used a can of Air Duster to blast sediment out of the panel channels; this is optional. I did this before I attached the door sweeps. 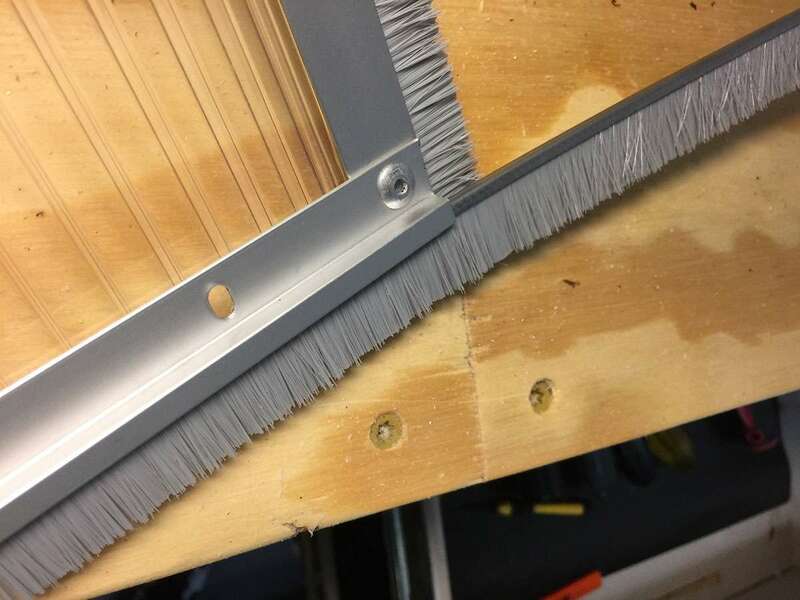 To reattach the bristle rods, bend each rod slightly before sliding it back into its sweep housing; this creates tension that will keep the bristle rod from sliding out of its housing. Congratulations! The dog door is nearly finished. All that's left to do now is to seal it, trim the bristles, and mount the door. 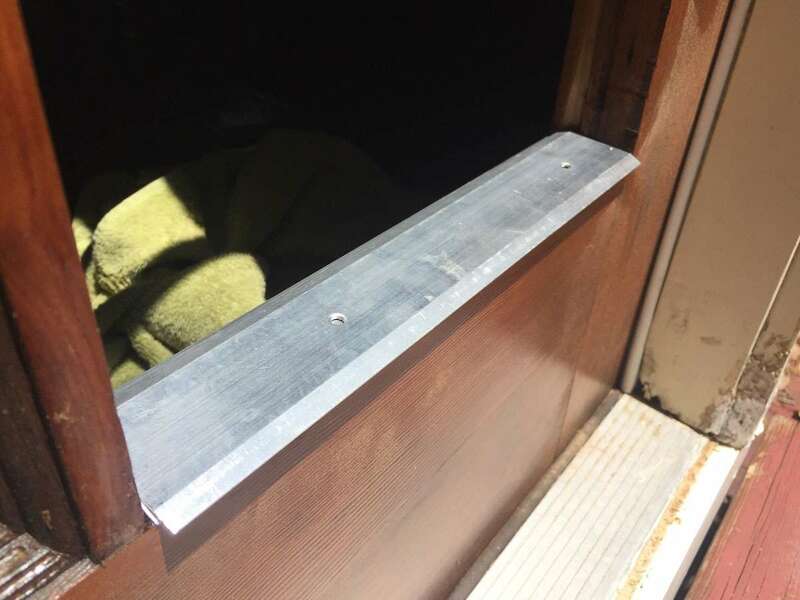 Sealing the areas where the panel meets the aluminum hinge and door sweeps will prevent water from seeping between the dog door's components. Now we're ready to install our door. We're going to remove the old pane, sand and seal the opening, install a piece of drip edge flashing, and install our door. 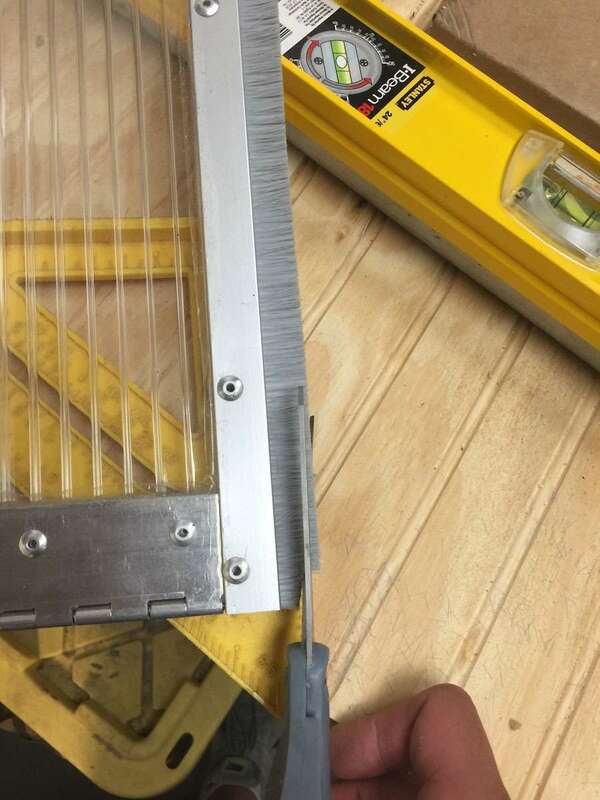 Essentially, use a razor blade to separate the wood molding and carefully pry it out. 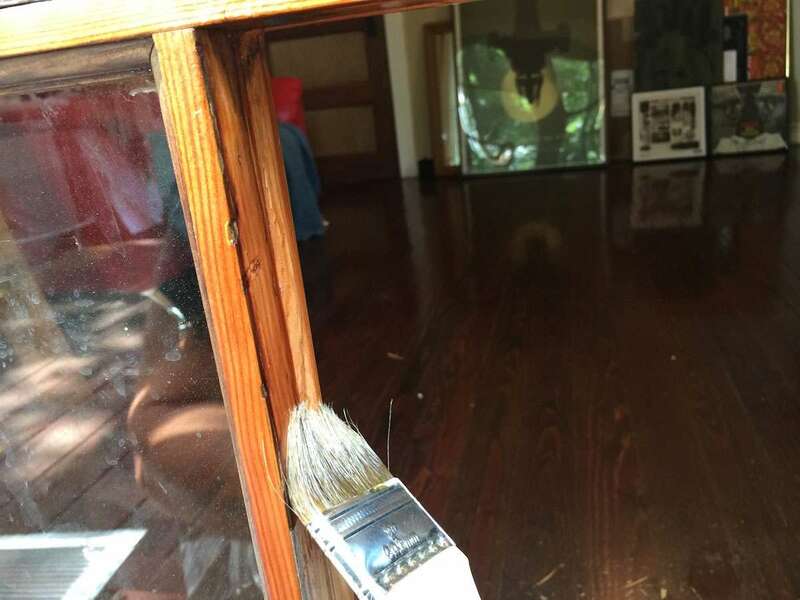 You don't want to damage the molding or glass pane since, if the house is ever sold, you may want to put the pane back in place. 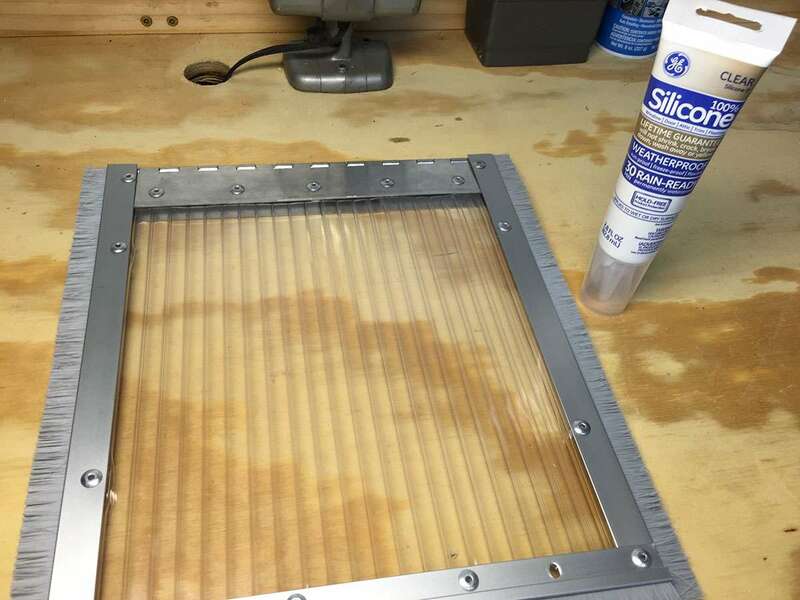 Put a cushion or pillow case down in case the pane falls out; however it's likely that your pane, like mine, is secured with silicone and will use some additional scoring to remove the old glue and free it. I used my power sander and 120-grit sandpaper to sand the opening nice and flush. 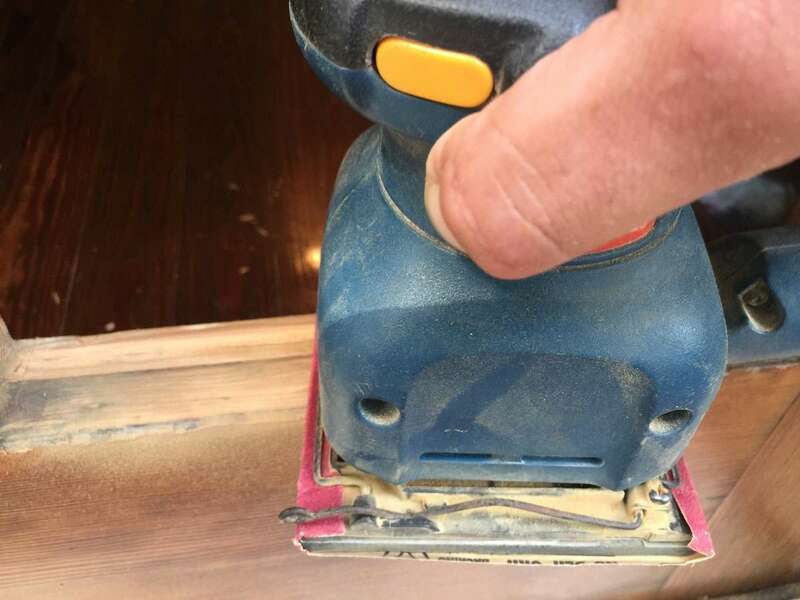 If you don't have a power sander, don't worry -- you can sand it by hand. Apply some Helmsman Spar Urethane to seal the opening. Should any stray water get past the dog door (like in a heavy storm), this will keep the wood from rotting. You can also use paint (since your door is probably painted) -- but my door is sealed using this stuff so I used it instead. This photo is a bit of an optical illusion; it looks like a back piece of wood molding is still there at this point, but that is not the case. Apply three coats, waiting 6 hours between coats. Looks nice! Because gravity, you'll want to add some extra protection to the bottom part of the opening. Since they didn't sell actual drip flashing (or a threshold the right size/shape) at the local home store, I instead opted to apply two aluminum threshold plates, with one offset to form a slant away from the building. 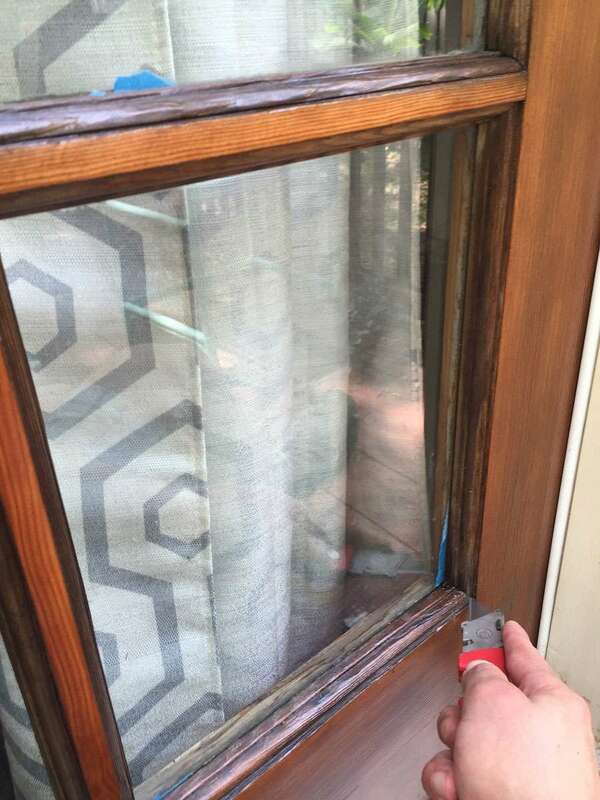 Cut the plates to the width of your window and secure them with silicone and the included screws. Pictured here is the first plate. Apply the second threshold plate, offset to cause pooled water to run away from the building. Drill two small holes through the first plate and secure the second plate using two screws. Note: This step is only necessary if you (like me) made your door too large. In fact, I made my door so large that I had to remove the bristles entirely (read: measure twice, cut once). Using scissors, cut the bristles to the proper width so that it closes easily but without leaving a large gap. Using very short screws, screw the hinge into the top part of the opening, securing it in place. I used 1/2" screws. If you use screws that are too long, they may pierce the glass pane above this one. Don't do this. Here's Sydney enjoying her newfound freedom and independence.